ADATA has launched a new lineup of its XPG-series SSDs, with the new models featuring 3D MLC NAND flash and targeted at gaming PCs. The new XPG SX950 family drives use a SATA interface and on paper deliver the performance expected mainstream SSDs. The key selling point of the new XPG SX950 products will be their six-year warranty and enhanced endurance ratings. The ADATA XPG SX950 resembles the company’s Ultimate SU900 drive announced late last year: both come in 2.5” form-factor, are based on the Silicon Motion SM2258 controller (four NAND flash channels, LDPC ECC technology, a DRAM buffer and pseudo-SLC caching support) as well as 3D MLC NAND - we presume from Micron. The XPG SX950 is a bit faster on paper as it supports sequential read speed of up to 560 MB/s as well as sequential write speed of up to 530 MB/s when pseudo-SLC caching is used. As for random performance, the XPG SX950 can perform up to 90K read IOPS and up to 90K write IOPS (see the table for details), which is a listed feature of the controller. The key advantages of the ADATA XPG SX950 drives are their long warranty as well as endurance/reliability, which is why the manufacturer did not maximize capacities of the SSDs and left some extra memory for overprovisioning. 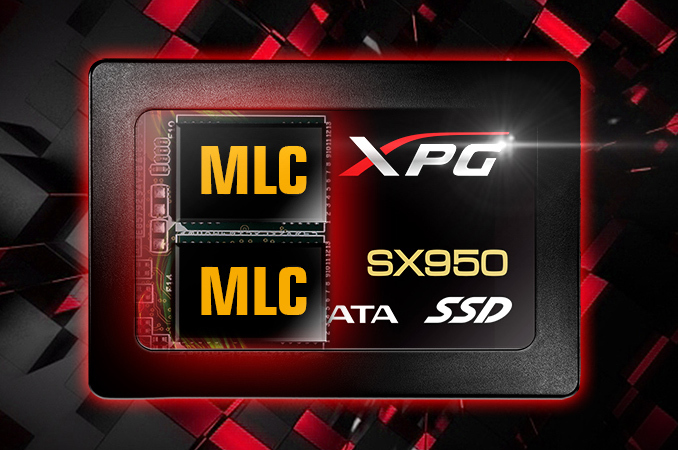 The XPG SX950 family includes 240 GB, 480 GB, and 960 GB models. The ADATA XPG SX950 SSDs are the fastest SATA drives from ADATA that are rated for 2 million hours MTBF and featuring the longest warranty (six years). ADATA would seem to have maximized the performance of the XPG SX950 vs. predecessors and improved endurance of the products at the same time, in exchange for a small amount of space for provisioning. The ADATA XPG SX950 SSDs are about to hit Amazon/Newegg soon and are expected to be available shortly. MSRPs for 240 GB, 480 GB and 960 GB drives will be $139.99, $249.99 and $449.99, respectively. The recommended prices of the XPG SX950 SSDs are slightly higher than the Ultimate SU900 series. Moreover, prices of the latter have dropped in retail since their announcement in 2016, so the actual difference will be even more significant initially. The slightly higher performance, improved endurance, and a six-year warranty will cost money, but it remains to be seen whether customers are willing to pay significant premiums for SATA drives today. Ol' Sammy has some mindshare in the ssd market. A fair number of folks see them as desirability superior. TBW = 200TB and only a 6 year warranty? The warranty is both TBW AND Years the one that comes first. Meaning , If your samsung dies in 3 years because you write alot on it , they will not repleace it even after 3 years ONLY , they will say "you reached the TBW sorry"
give me a 2 TB SSD with 3 years warranty for 300 euro. doesn´t have to be that fastest on the market. if i want best performance i buy a m.2. but for DATA disk a mediocre SSD would be fine. the effort for keeping HDD´s absolutely quiet is killing me. my system is silent.. only think i hear is HDD´s when accessed. We've seemed to have topped out at 1TB for budget drives.